The long-awaited judgment of the Constitutional Court handed down on Thursday brought to an end an almost four-year-long legal battle on the correct interpretation of a section of the Labour Relations Act. By Musawenkosi Cabe for New Frame. 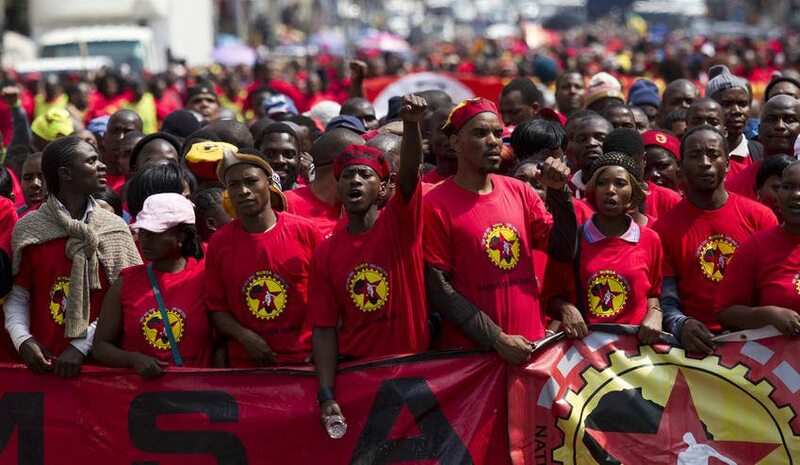 The Constitutional Court ruled in favour of the National Union of Metalworkers of SA (Numsa) – that an employee who earns less than the stipulated threshold (R205,000 per annum and less) contracted through a labour broker to a client firm for more than three months becomes an employee of the firm, “employed on the same terms and conditions of similar employees, with the same employment benefits, the same prospect of internal growth and the same job security”. The majority judgment was penned by Acting Justice Daniel Dlodlo. The court battle was between Numsa and Assign Services (Pty) Limited (labour broker or temporary employment services (TES)). The acting national spokesperson of Numsa, Phakamile Hlubi-Majola told New Frame that the union welcomed the Constitutional Court “landmark judgment”. “For us as Numsa this judgment is certainly a major step in the battle against banning labour brokers totally,” said Hlubi-Majola. Perhaps the most highly contested and difficult question before the Constitutional Court, was what happens to the employment relationship between a labour broker and the placed employee under the LRA 66 of 1995 once section 198A(3)(b) (the deeming provision) kicks in. Does the employment relationship under the act with a labour broker come to an end, or, does the provision create a dual employment relationship, where both the labour broker and the company become employers of the placed worker? Lower courts had a different interpretation of the law – on what happens once the deeming provision kicks in. The matter came before the CCMA (Commission for Conciliation, Mediation and Arbitration) after 20 workers, mostly Numsa members placed by Assign Services, had worked beyond the three months of temporary service which had triggered the deeming provision. Numsa submitted that the dual employer relationship advocated by Assign Services would create uncertainty and adversely affect workers’ rights. The commissioner preferred the sole employer interpretation – on the bases that the dual employment would create confusion for the vulnerable on issues of unfair labour practices. The Labour Court preferred the dual or parallel employer interpretation advanced by Assign Services, dismissing the CCMA interpretation that section 198A(3)(b) created a sole employer. Dissatisfied with the outcome, Numsa approached the Labour Appeals Court (LAC), which rejected the dual employer interpretation and found that the client of the labour broker was the sole employer of the placed employee after three months of temporary work. Assign Services petitioned the Constitutional Court against the LAC decision. The majority unsurprisingly dismissed the dual employer relationship interpretation preferred by Assign services. Oral submission made by the legal representative of Assign Service on 22 February this year – that having two employers better protected the constitutional and LRA rights of the employee – was met with mocking laughter from the court gallery full of workers. Refuting the dual employer argument, the Constitutional Court first noted that, retaining the labour broker as an employer would frustrate the intentions of the amendments of 2014, to bring about certainty in employment relationships of vulnerable workers. Without certainty, casual workers cannot exercise their rights effectively and a number of practical difficulties can arise from this uncertainty. These include not knowing who to sue in cases of unfair dismissal, having to comply with two different codes of conduct and not knowing the appropriate procedure to follow. The most important uncertainty related to the right to strike. A strike could be protected against one employer – but not the other – which could lead to unfair dismissal. These were some of the practical difficulties created by the dual employer relationship noted by the Constitutional Court, in finding in favour of Numsa. Justice Dlodlo emphasised that the amended provision did not ban TES or labour brokers as argued by Assign Services, but regulated them. Right after the Constitutional Court handed down its judgment, Sydney Moshoaliba could not contain his excitement. Moshoaliba told New Frame that the case was a huge victory for workers. Moshoaliba has worked with labour brokered workers as an organiser at Casual Workers Advice Office (CWAO) and feels that organising workers will now be much easier. Ighsaan Schroeder, director at CWAO – who were admitted in the case as friends of the court, told New Frame that this is an important judgment that will tightly regulate the labour broking system – “very, very few of these workers, their work is temporal – most of them work for labour brokers for nine to ten years in these so-called temporal jobs”. He added that with this judgment “work will now be genuinely temporal”. Hlubi-Majola of Numsa echoed Schroeder’s sentiments, that the judgment explained the nature of the relationship between a labour broker and a casual worker: “Relationship between a labour broker and casual workers is a temporal relationship” and if the client company “decides to extend that service than that worker must be absorbed to the main company”. Schroeder also explained that temporary workers usually get lesser wages than permanent employees of the client or firm and are often treated unfairly at work – “for example, we dealt with a case where a company had a clinic for workers but only permanents could use it … so this is a big thing for workers”. However, Schroeder cautioned that in the past cases have been won on behalf of workers at the CCMA but bosses have refused to implement the decisions. In his view, it will now be necessary to organise to ensure that workers are aware of the judgment, and their newly affirmed rights.